I don’t usually make items specifically for Etsy but since nothing has sold yet, I figured I’d make a couple things specifically for the season. Hoping to get more traffic! 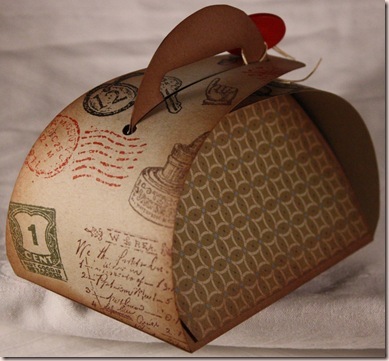 This box was created with my slightly altered version of Papertrey Ink’s Timeless Template called Ready, Set, Wrap. I found that it was NOT symmetrical which I found very annoying but it wasn’t hard to remedy by folding it both ways and fixing it. Still worth the $5. The base is close to cocoa sponged with the same ink. The side panels are stamped with vintage images and sponged with close to cocoa also as well as both front and back paper panels. 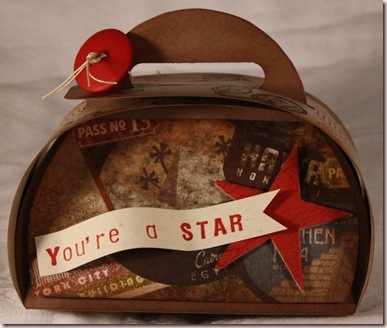 The chipboard star is covered with cardstock and stamped with a crackle background stamp. Accessories: button-Basic Grey, hemp twine-UK. All products by SU! unless otherwise noted. Love the way you decorated Lauren’s latest templates…so masculine.